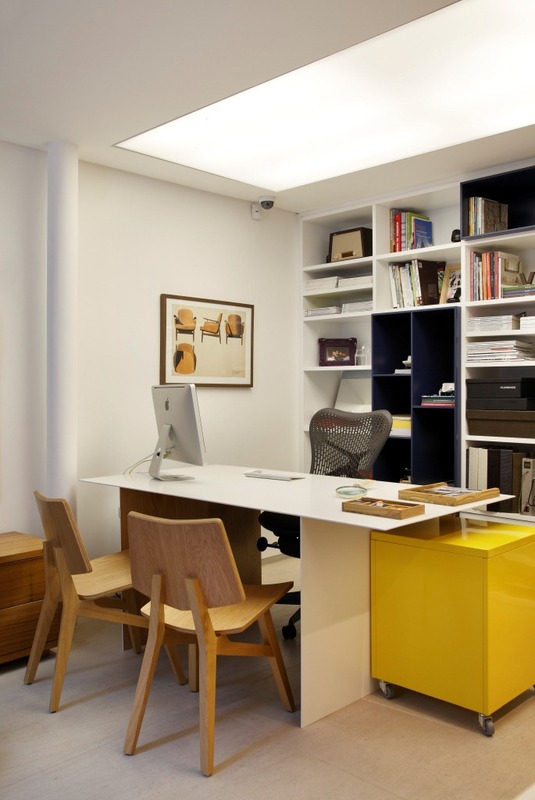 Rio de Janiero-based architects Andre Piva Arquitetura recently sent over some great shots of their lovely office. As you can tell, the space is very well put together, matching usability with a comfortable atmosphere. In terms of decor, the office has a number of fun art pieces from the wall version of Robert Indiana’s LOVE sculpture to the Banksy pillow. Other art adorns the walls throughout, which to me is a welcome addition as it seems most office walls are completely plain. There are also some great architectural features throughout. Just look at the stairway and the rotating from doors. And of course I love the rustic brick wall fronted by the bright and modern bookshelf. The space is comprised of a mix of furniture from different eras and designers. But while there is often some nice symmetry to an office filled with Herman Miller or Knoll, the eclectic mix in this space creates a very comfortable office with a lot of warmth and character.